Hello, friend. I must confess: I don’t believe in OMG ANTIOXIDANT SUPERFOODS too much. I believe that some foods are more full than others of the things that make us healthy and happy, yes. These foods come “packaged” in skin and shells and scales, they have roots and rinds, ripeness and rottenness. But! Sometimes it’s such fun to play with the buzzwords, to write a recipe crammed with as many delicious natural ingredients as possible that are also included in the “antioxidant superfood” lists (such as they are). Grassfed butter, pastured eggs, cinnamon, turmeric (don’t forget the black pepper, because curcumin loves piperine like peanut butter loves jelly!) and cacao. Blueberries, walnuts, and ginger. 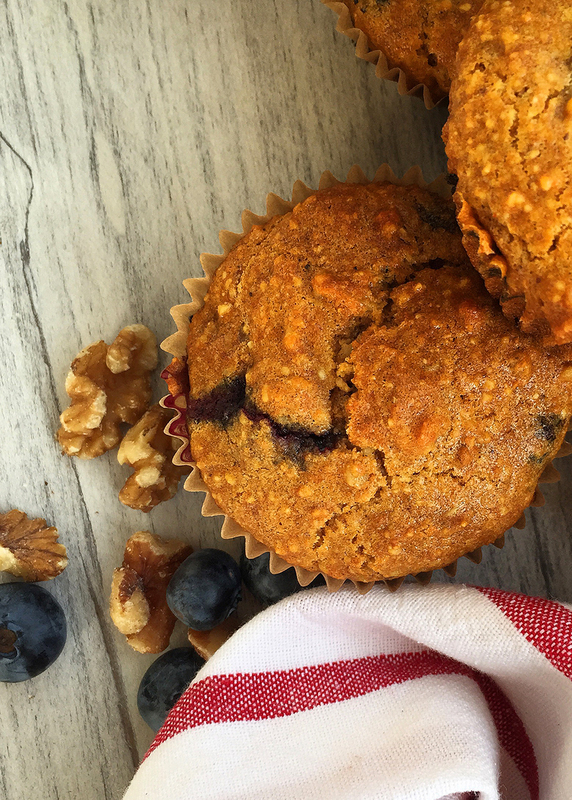 With a list of ingredients like that, is it any wonder that these happy, berry-packed, citrus spiked, warmly-spiced, nutty-crunchy little superfood muffins were the result? Now, blueberry muffins are not the totally-super-unique-snowflake kind of thing to post on a food blog, but these are not your average, everyday blueberry muffins. With a drizzle of coconut cream and a dollop of honeyed goji compote, my first thought when I tasted these was not so much superfood muffins as superhero muffins. These fight crime (all that tummy-friendly grain-free, dairy-free goodness) plus look good doing it. Okay, the analogy is a stretch but if Wonder Woman ate breakfast it would be one of these and a black coffee, to go. 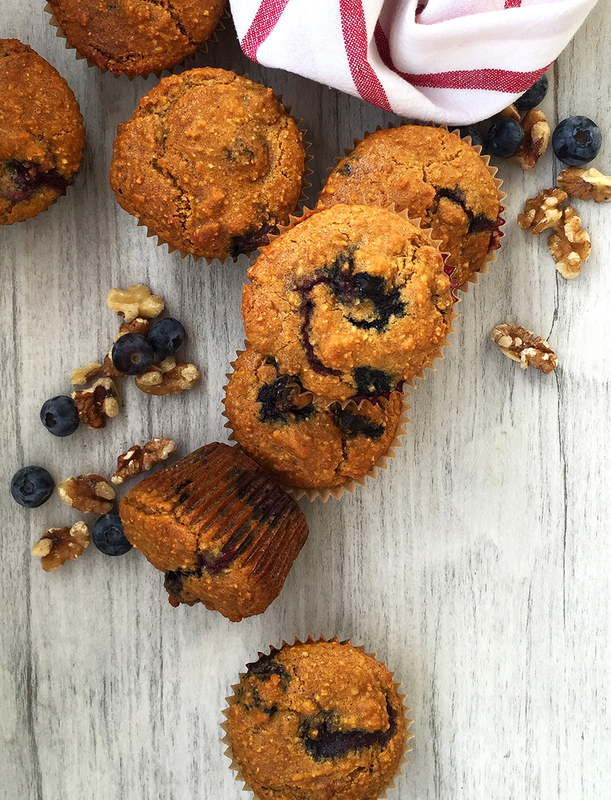 These grain free, dairy free, refined-sugar free muffins are loaded with flavor and perfect for breakfast or a power snack. Cacao nibs are very bitter, so omit if you prefer a sweeter muffin. Wow, girl! You definitely have a way with words when it comes to describing your recipes. My mouth is watering! I’m not usually one to follow all the “SUPERFOODS OMG!” stuff like you said, but I love your idea of superhero muffins, haha! Great idea to add the turmeric in there too. Pinning these for sure! Thanks, Dana! I love putting turmeric in baked goods… such a warm color and taste. These look so yummy! I love that you added orange zest – such a lovely flavor with blueberries. These were so good I had to freeze them to stop myself eating most of the batch! 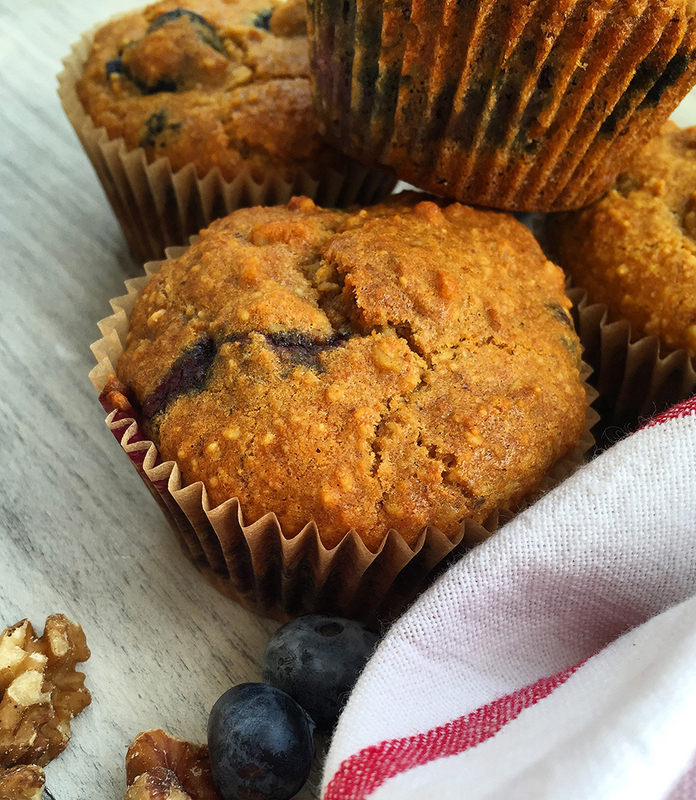 You weren’t kidding when you called these superfood muffins!! These guys are packed with awesome ingredients!! Maybe went a tad over the top, but superfoods are so fun! Oh yes please!! Do you deliver?? The ingredient list alone gets me excited !! Your excuse to come to San Francisco! These look fantastic– I love the inclusion of arrowroot, cocoa nibs, butter– oh! Walnuts. So many favorites. I am cooking for my mother-in-law who is doing a grain-free keto thing for healing cancer. These look like a nice treat!!! Pinning this! These sound delicious but is there any substitute for the arrowroot flour please? I would try a straight substitution of tapioca flour. It will make for a chewier muffin, however. These look amazing. It is a really important point that you made about eating pepper with turmeric, they really are synergistic. I have been looking for something new for afternoon snacks and these look perfect. I also love that there isn’t a ton of honey or other sweeteners in them. I love it when that happens (have all the ingredients)! Love the idea of a superhero muffin! These are certainly packed with a plethora of amazing ingredients. These are awesome Muffins! Hope you are having a great week and thanks so much for sharing with Full Plate Thursday. LOVE this recipe idea! It’s so packed with wholesome ingredients…I am definitely going to give these a try! Pinned! Would this still work if I omit the baking soda? Thanks for the recipe though! Fantastic! I haven’t made them in ages… I should again! Favorite muffins I’ve made in a while — we all loved them. Didn’t have turmeric but can’t wait to use it next time. Thanks for the recipe! I tried the muffins today. Really liked them. Where do i get the nutrition information on them? Hello Esmeralda, I’ll be transitioning to a recipe format that outputs the nutrition information soon, stay tuned!